The last photo in the essay following one woman, Maria Ramona Espinosa, through boot camp at Hunter College shows the WAVES’ classroom activities. Maria Ramona Espinosa recites in one of the classes which occupy a large part of her time at the training school. 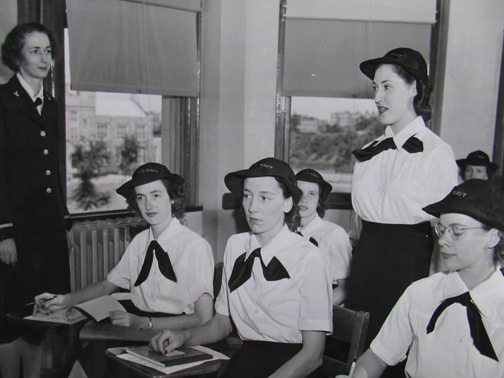 Seeing the old WWII picture of WAVES in uniform in the classroom setting reminded me of similar WWII pictures taken at HMCS Conestoga, which was the WWII training base for Canadian Wrens in Galt, Ontario, Canada. Two interesting books have been written by former members of the Women’s Royal Canadian Naval Service and are both amply illustrated by photographs of the era: ‘The Girls of the King’s Navy’ by Rosamond Fiddy Greer (Sono Nis Press, Victoria, Canada, 1983) and ‘On the Double, Matilda!–One woman’s story of life as a Wren’ by Audrey Sim Shortridge (Lookout Publishing, Victoria, Canada, 2006). Thanks for the tips on the books. The one big difference from the WAVES and all other services in the U.S. is that the training bases were set up at college campuses. No other service branch did that. And as a result, the women we’ve talked to all associated their service with something like college. It’s very interesting.